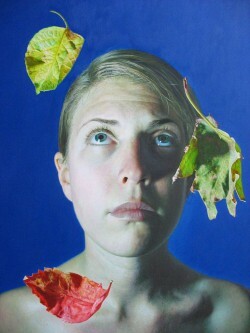 David Rivera is an accomplished artist and Professor of Fine Art based in Newton, Pennsylvania. He has studied at both Pennsylvania Academy of Fine Art and the New York Academy of Figurative Art. His expertise lies in historical painting methods and Art History, though he also has experience teaching other artists skills used to enhance their portfolios. His goal as an artist is to visually expose beauty within commonplace objects as subjects. He has perticipated in juried museum shows and gallery exhibits in the greater Tri-State area. Rivera considers himself an observer. Through his survey of the world he uncovers an “extraordinary beauty” of common objects used in everyday life. The subtle intricacies of his work are rendered through his exaggeration of color, tones, and texture. 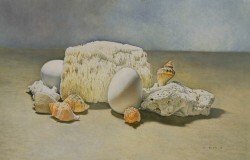 Rivera’s painting, Absence of Tide, presents the traditional subject of a still life. He intrigues the viewer by providing a desolate space for these rare and beautiful nautical objects, without the presence of the sea. This creates a contrast between the richness and sharpness of the forms, and the starkness of the background. The shells and the rocks are thus enhanced and resonates towards the viewer. This is also continued in his painting Passages. The leaves are pushed almost into the viewers space, and are so highly detailed that one might swear they are real leaves. This manipulation of images within his work is signature of his style and artistry. May-June Ellarslie Open XXVIII Trenton City Museum (Juried exhibition).